Petits Farcis Niçois at La Petite Maison, Mayfair, London. Back in April I spent an indulgent afternoon with a good friend sampling the tempting delights of La Petite Maison, a restaurant in London’s Mayfair which describes its cuisine thus: ‘combining the best fresh seasonal ingredients with the culinary influences of the Côte d’Azur and neighbouring Liguria’. 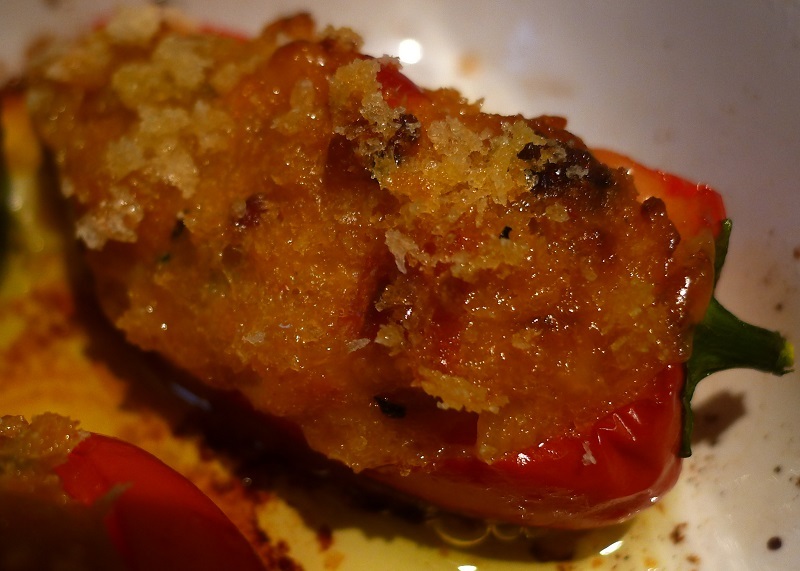 Popping up on the menu were so many Riviera favourites together with some iconic bottlings from the region, but my attention was immediately drawn to the Petits Farcis Niçois or stuffed vegetables, which I hadn’t tasted for years and had certainly never cooked myself. 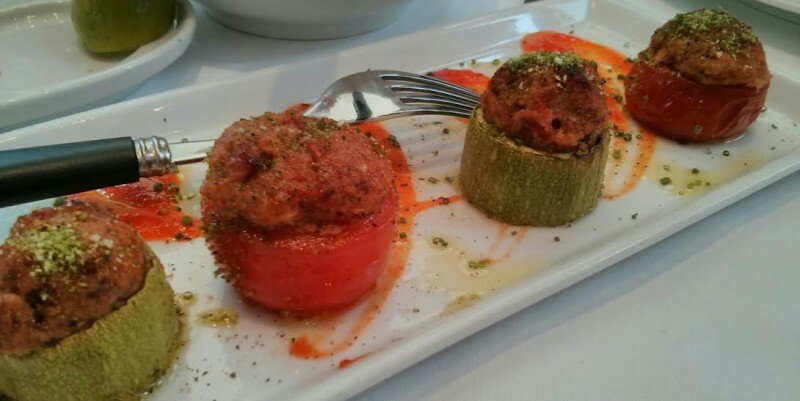 These little bite-sized portions of courgette and tomato (see photo above) looked so dainty, and they were awakened by the strong flavours of the veal stuffing, the resulting ensemble melting slowly in the mouth. I came away wanting to recreate this idea at home, and so began the research…..
Farcis, known as ripieni in Liguria are eaten all along the Riviera, but in usual local style thoughts on the stuffing ingredients vary from place to place. The elements common to most recipes are garlic, herbs, eggs, the scooped-out flesh of the vegetables themselves and leftover meat (ham, beef, veal, pork or a blend of more than one, chopped up finely). Some cooks add cheese, others rice. I came across breadcrumbs and mushrooms too, but what seems clear from the text accompanying many of the recipes I looked up, is that here is another recipe demonstrating the creativity and frugality of the people of the area who have traditionally used up leftovers from yesterday’s lunch and blended them with the fresh produce available to them locally. Mireille Johnson, writing in her book ‘Cuisine of the Sun’ explains the raison d’être of these delicious morsels so romantically: “Farcis are a summer staple in Nice. On Sundays and festive days housewives and children carry large trays of freshly stuff vegetables to the village baker’s oven, returning at noon to pick up their crisp, golden farcis. Served at most picnics or buffets, farcis are usually prepared in large quantities, since they are delicious warm or cold”. She also advises the use of small vegetables and the avoidance of over-stuffing them. 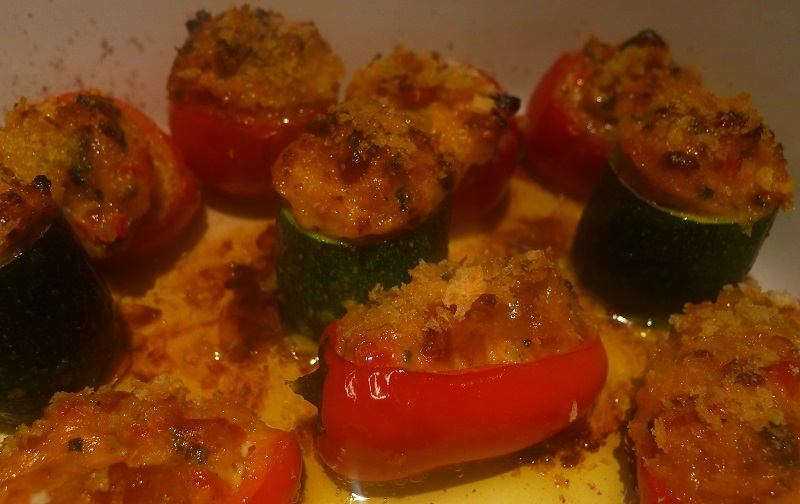 For my version of the dish, I used baby peppers, young courgettes and medium-sized vine tomatoes. 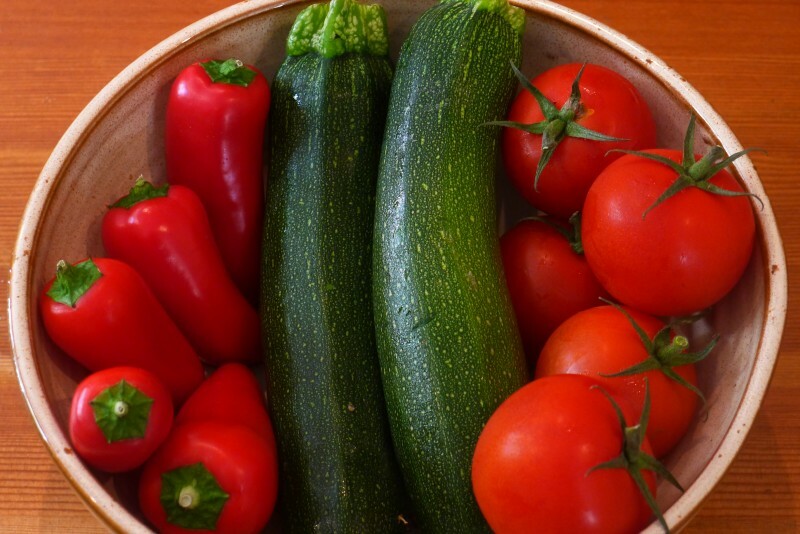 Served warm, the courgettes and peppers would make great canapés, the tomatoes would work better as a light lunch dish, with a green salad, as finger food they are not. Bon appetit! Chop the courgette into four rounds and scoop out the flesh, ensuring that a good base of flesh is left at the bottom so as to make a small cup shape. Slice the top off the tomatoes and scoop out the flesh and seeds. Cut a slice across the length of the pepper and clean out the inside. 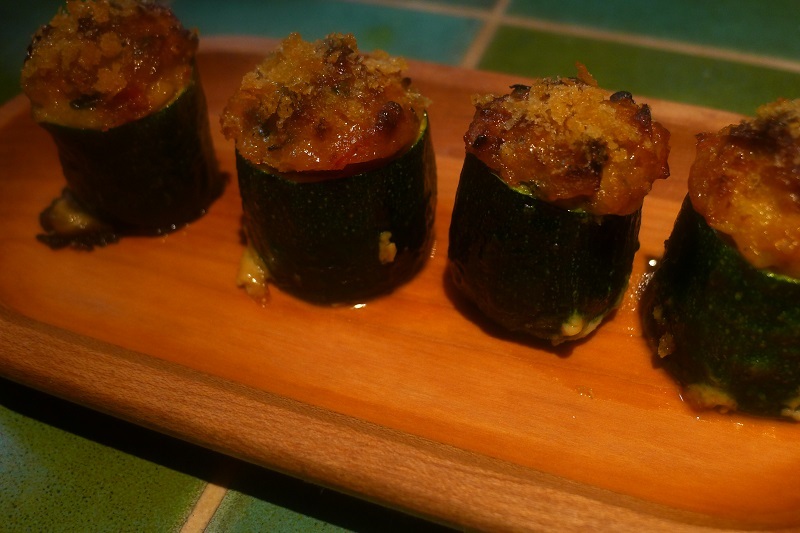 Place the hollowed-out vegetables in a baking dish and drizzle with olive oil. Chop and reserve the courgette flesh, tomato pulp and seeds. Chop the pepper ‘lid’ into small pieces and add to the courgette and tomato pulp. Next, sauté the onion and pancetta in olive oil for 5 minutes on a medium heat stirring regularly. Then add the crushed garlic with 15g of the breadcrumbs and stir for a further two minutes. Add the reserved vegetable pulp and cook for another five minutes, stirring all the time. Then add the fresh, chopped herbs and stir for a minute or so. Remove the mixture from the heat, place in a small bowl. and stir in the grated parmesan. Add salt and pepper to taste. Finally, stir the beaten egg into the mixture. Fill the hollowed vegetables with the mixture, sprinkle with the remaining breadcrumbs and drizzle with olive oil before placing in the pre-heated oven for 20-25 minutes uncovered. The tops of the vegetables should be brown and crispy when you take them out of the oven. Yummy. Last weekend found us drinking some delicious and elegant white wines from Bellet and the Riviera Ligure di Ponente – watch this space for a post on Vermentino / Rolle / Pigato coming soon. Midweek, however, we are looking for well-made, reasonably priced wines, so this week’s offering from Aix en Provence fits the bill perfectly. 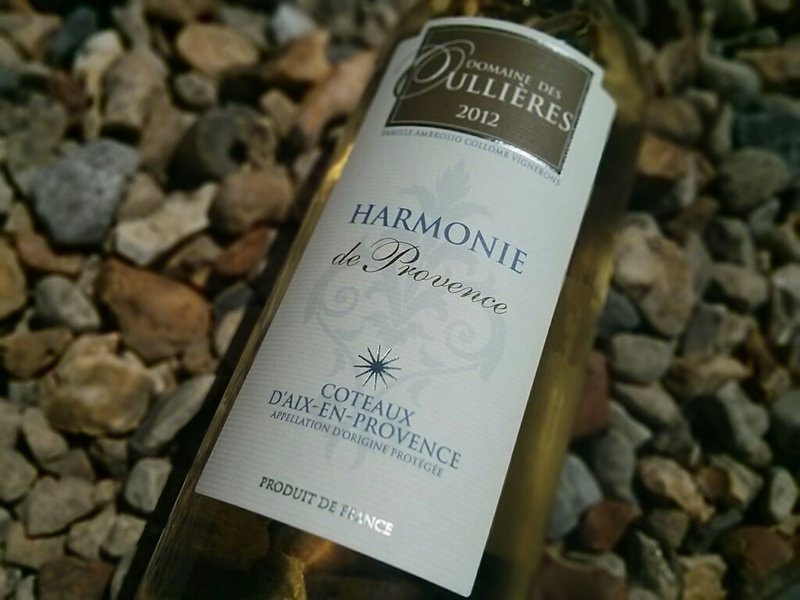 Domaine des Oullières‘ Harmonie Blanc is a wine I’ve often picked up on the way out of Yapp Brothers, a specialist importer of French wines here in the UK, for whom I do the odd bit of work from time to time. A blend of Rolle (aka Vermentino), Grenache Blanc and Ugni Blanc, it seems to tick the right boxes with many a journalist. For me, the herb and pepper notes on the palate are key alongside a subtle tinge of orchard fruit. It’s great to find a source of typical, well-made, but not over-priced white provençal wine like this one, and the Domaine makes a good rosé with the same ‘rapport qualité-prix’. We drank the white with a chilled courgette and basil soup on a balmy evening, and it is made for such local favourites as pissaladière, tapenade toasts or seafood stew. Looks like I’ll be buying another bottle to confirm and indulge in these most provençal of pairings. Santé! 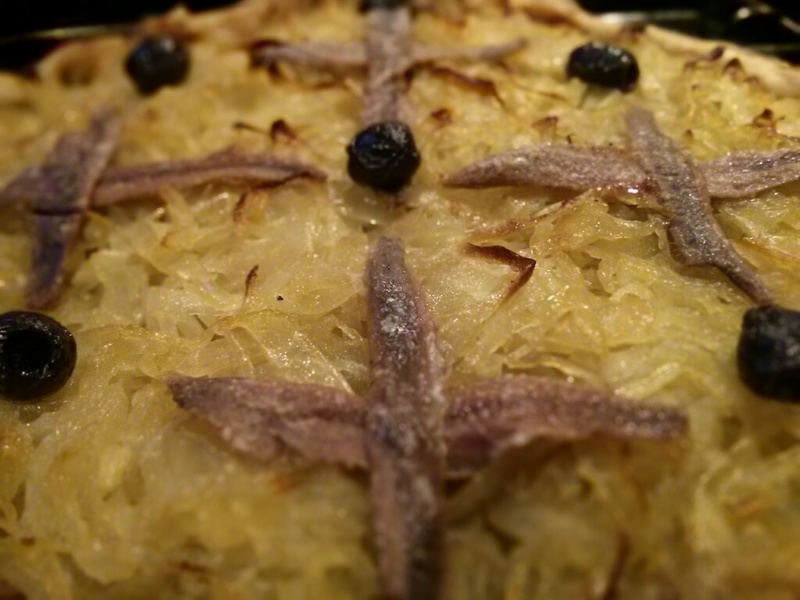 Pissaladière – tart or pizza? 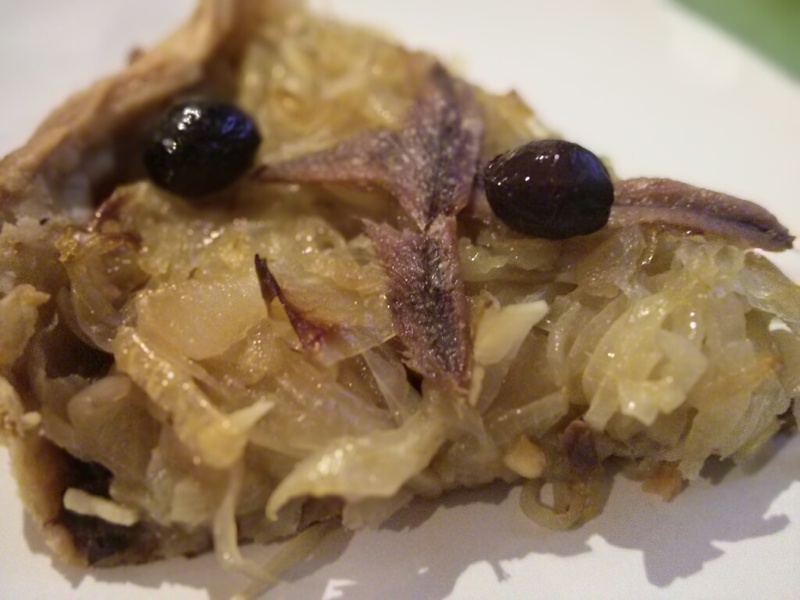 Caramelized onions, anchovies and olives – the key components of a pissaladière are never in question. But as to whether this dish, popular on both sides of the French / Italian coastal border, should be made with a bread dough base similar to focaccia or with pastry is up for debate. Having read around the subject it would seem that the former option is more widely accepted as the traditional recipe, but I beg to differ with popular opinion so you will find my recipe below, using pâte brisée. The combination of the crumbly, crisp pastry with the melting onions and sharpness of the olives and anchovies is irresistible. Another twist in my recipe is a thin layer of black olive paste which I spread over the tart base before ladling in the onions. If you can resist, leave the tart to cool once cooked as you will find it at its very best eaten cold. Serve it with a chilled Vermentino or even a provençal rosé. And if you prefer a bread dough base, you could use the focaccia recipe I posted recently, omitting the rosemary. Brush the base and sides of a loose-bottomed 30cm tart tin and prepare the pastry. Place the flour and salt in a bowl and rub in the cubes of butter with your hands until the mixture looks like breadcrumbs. Add the egg yolk and water and work the ingredients together to form a soft dough. Wrap the dough in clingfilm and leave it to rest in the fridge for 2 hours or overnight if you prefer. When you take the pastry out, allow it to reach room temperature before rolling it out on a floured surface until it is around 5mm thick. Place the pastry into the tin and press it in lightly with your hands. Prick the surface with a fork a few times, cover and leave in the fridge for half an hour. Heat the oven to 200°C and then turn your attention to the onions. Fry them on a low heat in a large frying pan with a swig of olive oil, the thyme and bay leaves, and leave them to cook gently for half an hour or more without browning. When the oven is up to temperature, remove the pastry case from the fridge, cover the base with greaseproof paper and fill with baking beans. Bake blind for ten minutes until the pastry is starting to crisp. Remove from the oven and set aside. In a small foodmixer, whizz up the black olives with 20-30 mls of extra virgin olive oil, the chilli flakes and the sage. Once the onions are soft and sticky, take them off the heat and remove the bay leaves. If there is a lot of liquid in the onion pan, pour that away. Spread the black olive mixture onto the bottom of the tart case, ladle in the onions and top with anchovy fillets and a few black olives. Drizzle with extra virgin olive oil and pop in the oven for 20 minutes at the same temperature as before. My mouth is watering just thinking about it. Must make another one soon! I hope you enjoy it too. Monday and Tuesday evenings are usually alcohol-free in our house so by Wednesday we are ready for a glass of something new and interesting to celebrate being halfway to the weekend. If you follow my twitter feed, @pestopistou, you will have noted that yesterday (Tuesday) proved an exception to this rule, but you might also spot that this minor slip-up was made in the name of research for today’s first post in a forthcoming series of Wednesday’s Wine features. We will aim to uncover some great wines from the Riviera and beyond with a smattering of wines from further afield if we’re travelling or spot something unusual that’s worth reporting on. 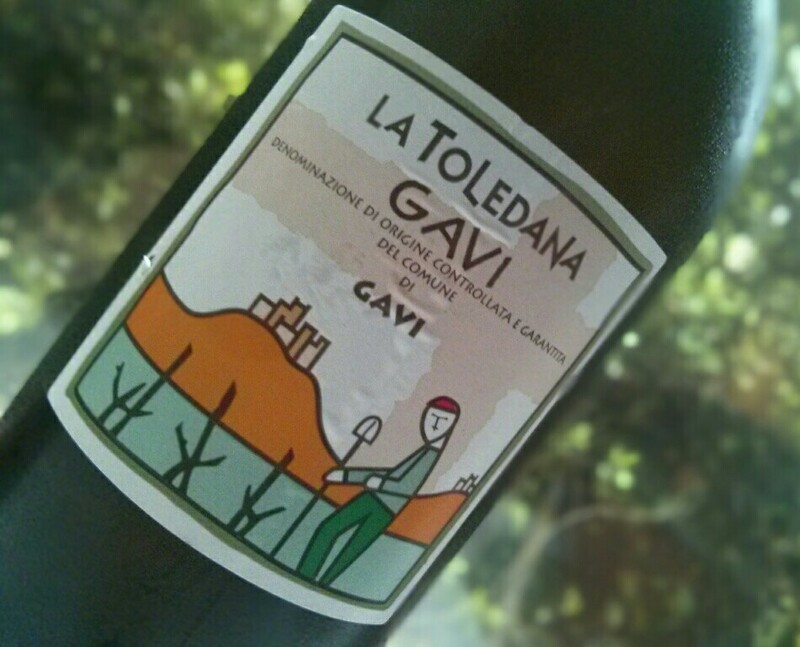 So to tonight’s wine: Gavi lies some 50km to the northwest of Genoa, just over the Ligurian border in Piedmont. The white wines from this area are from the Cortese grape and those made within the commune of Gavi itself can be labelled as Gavi di Gavi. This Wednesday’s wine is from the Azienda Agricola La Toledana, a co-operative producing this intriguing single-estate bottling from late-harvested grapes which gives it an unusual weight and concentration. This extra punch sits well with the wine’s refreshing acidity, grapefruit and pear flavours and long, minerally finish. One we will most certainly be drinking again. And to match? 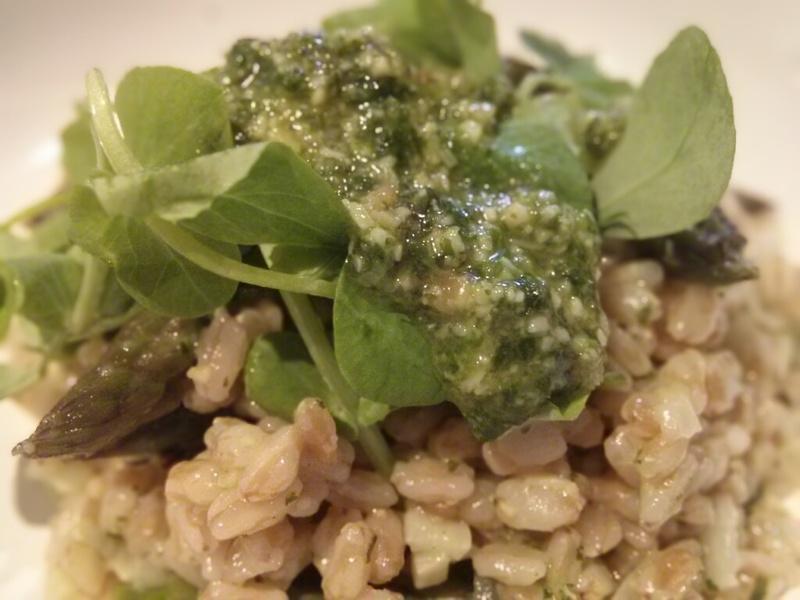 We cooked up an asparagus speltotto (risotto made with pearled spelt rather than rice), generously dressed with pea shoot and mint pesto. A perfect reward for making it to Wednesday.